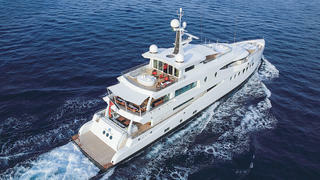 She might be the second yacht in Amels’ 199 Limited Editions range, but Madame Kate is no mimic. Although all Amels Limited Editions are developed on platforms, no two of any of the models from the 54 metre yachts to the 73 metre range have ever been exactly alike — and so it is with the first two 199s, Event and Madame Kate. 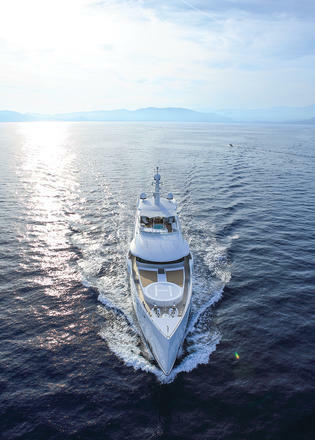 A project that was on the fast track from the beginning, Madame Kate was delivered just 24 months after the owner tasked his representative, Benoît Faure of Yachting Concept, with finding a new yacht. 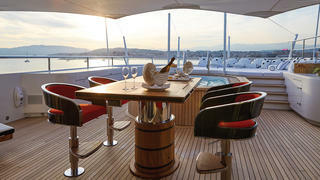 Faure’s relationship with this owner goes back years to when he helped arrange charters for the owner and his family. 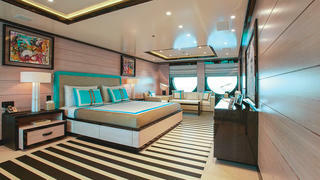 Faure then assisted the owner with a new build, a 43 metre composite yacht at an Italian yard that was completed in 2010 to designs by Zuccon International Project and the owner’s decorator. In early 2013, however, the owner approached Faure about a new, larger boat, but he had two caveats: fast delivery and high quality, which are often mutually exclusive items. 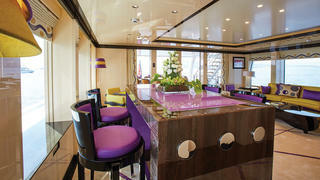 Faure zeroed in on the Limited Editions approach at Amels and the 199 already under way on spec. The owner visited the yard and also reviewed Event, and while he was satisfied on most counts, he wanted to deviate from the first hull’s general arrangement with longer sun and bridge decks, a gym at the stern like his previous yacht and the relocation of the galley to the main deck, taking the place of an office. Both the owner and his wife are gourmets, Faure explains. “They wanted to put the art of making fine cuisine into the centre of the boat.” As far as the interior went, they liked what Italian interior designer Laura Sessa had done with Event, but did not want it replicated. Their style is very youthful and exuberant with bold colours and a lot of joy, elements that Sessa, who never shies away from bold colours, understood and delivered. 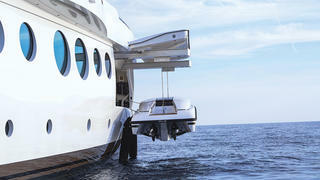 From the beginning, Madame Kate’s owners wanted a boat that could stand out in a crowded harbour. They talked about paint schemes in several striking colours but were reluctant to commit. When the discussion turned to exterior lighting, however, and the fact that they wanted to be able to change those colours, including the underwater lights, with a few clicks on an iPad, Amels suggested pearlised paint — it would not only look dazzling against the blue sea, but also would take on the tones of the reflected light at night. That idea was a hit, but the trick was to figure out how to deliver it. 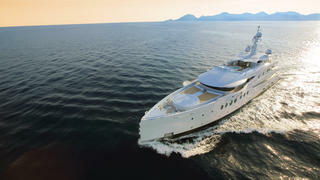 This stunning pearlised white livery accentuates Madame Kate’s sweeping hull line from amidships to the aft platform. It also creates a surface where designer Tim Heywood’s complex shapes and their shadows are in the spotlight. Although a white hull tends to be more forgiving of paint imperfections than a dark one, a coating with refractive properties adds complexity. “If you make a mistake in the pearl, like a runner, or fish eyes or dust inclusion or whatever, you have to go right back to the base and then start over. So any mistake, you’ll have to redo the entire job,” says Dubbeld. Of course, all that holding of breath is a behind-the-scenes issue, as it should be. 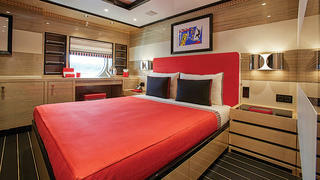 To the owners, guests and dockside spectators, the yacht’s exterior just looks lively and fun. And fun is what Madame Kate’s lifestyle is all about — from a tempered-glass Foosball table with bronze and steel players to the gym with a window onto the world, from accommodations for some very pampered pets to a custom pizza oven, it seems everything has been considered. 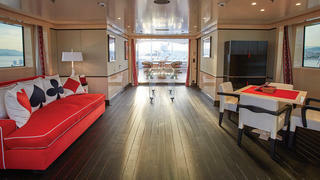 Like their last yacht, planked wood floors predominate and announce the theme of casual elegance. These floors, however, are a big part of the décor, establishing the ebony and ivory background found throughout the yacht. The bleached maple and black-stained oak floor pattern in the main deck foyer and dining salon looks a lot like piano keys. It’s a treatment that extends through to the master suite; beginning with what is arguably the most inspiring office afloat. It is finished in whitewashed and black-stained oak and given a bright pop of turquoise in fabrics and upholstery. Instead of a bank of closets lining a wall and scattered dressers, the walk-in closet is big enough to function as a dressing room. 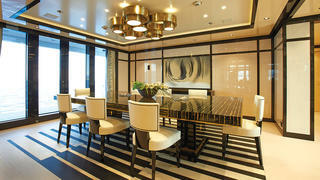 This separates a pair of bathrooms; hers is clad in dazzling white alabaster as a nod to the yacht’s exterior. Oak is the prevailing timber, either as open grain, washed, ebonised or rubbed with graphite and then clear-coated in high gloss, accented on the main deck by a dark-stained lacewood with a gloss surface for door frames and mullions. All the suites have oak floors in various combinations of light and dark, linked by a spiral staircase clad in natural and black leathers. 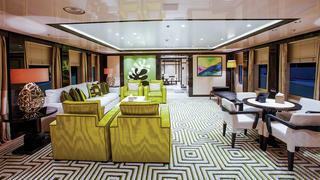 Two identical VIPs, one splashed with orange and one in yellow and blue, are located aft of the bridge and captain’s area and buffered from the bridge-deck salon by a lobby and the dayhead. This salon is a casual, multifunctional space with a mix of cushy lounge seating and games areas that works as a bridge to the large al fresco dining deck beyond with its own outdoor sofas. 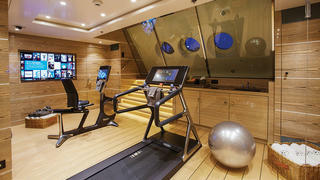 Three additional and spacious guest suites are on the lower deck and have direct access to the gym and sauna aft. The stonework on this deck is a rich chocolate and gold Porto marble. Circular windows in the stern let in light even if the yacht is underway to keep guests bent on fitness from feeling like they are in a cave. At anchor or dockside, the stern door, which hinges at the top, can be opened, allowing expansive views through tinted glass windows and a door to the ample swim platform. Madame Kate has luxury of space everywhere, with wide corridors that seem residential in proportion and very large landings and lobbies. The offset dining room is a beautifully fresh space, uncluttered by sideboards and cabinets, yet all the china, cutlery and glasses are close at hand; a walk-in china storeroom hidden behind a wall panel sees to that. The dining room can seat up to 14 for meals with an expandable table, but the real treat is that the room itself lengthens, as the bulwarks on either side of the yacht fold down to create terraces, extending the view as far as the eye can see through full-length sliding glass walls. 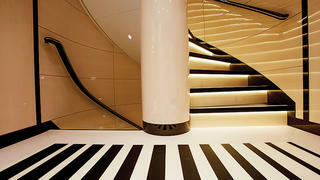 The main salon space is treated more formally with a Tai Ping carpet, avant-garde bar and symmetrical seating. Its TV is hidden behind a screened Warhol-style tongue-in-cheek image of madame Kate herself, who just happens to be a fluffy white dog. With the galley located on the main deck, the crew and service areas below are even more spacious; Faure and the yacht’s captain worked out with the yard excellent service pathways, pantries, equipment lockers and even linen storage, reflecting the fact that this boat will be in owner-mode much of the time. Outside, the yacht’s scimitar bow is the big talking point, a feature that maximises length, increases displacement speed and reduces pitching and vertical acceleration. It also means the 60-metre 199 performs more like a conventional 65-metre boat and will be up to 15 percent more fuel-efficient than an equivalent clipper-bowed vessel. When Amels CEO Rob Luijendijk asked Heywood to draw up a new model offering an option between the Limited Editions 180 and 212, Heywood did as asked, and presented a conservative 199 with a raked bow. Then he showed them what he really had in mind: a long, lean totally non-conformist look with a jaunty adaptation of the axe bow Amels’ parent company Damen uses on its offshore vessels and its Sea Axe yacht support vessels. Heywood’s curved scimitar bow is more suited to displacement speeds, its sculptural spray rail keeping water from climbing up the hull. “Looking at the long list of modifications on the owner’s wish list, I was really impressed by the speed of reaction from the Amels team and the quality of the solutions given to us,” Faure says. 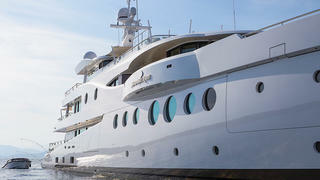 “It made the owner feel that he was building his yacht in the right place.